A tasty little fish from the Tevali family??? Halloween fun at Shelter Bay Marina. Kathy is dressed in authentic Kuna attire down to the beed leggings that measure over 60' long and contain untold tiny beads. We have completed the sale of our old sailing catamaran s/v Pacifica! It was tough having two cruising catamarans and it's a huge relief to have sold Pacifica. Now we can focus on really having some fun with no stress financial or otherwise of having two boats. Plans are in flux as usual, but what ever we plan next for our new boat s/v LightSpeed it is sure to be a great adventure. Enjoying Cartagena and lucky for us to arrive for Carnival. An amazing city steeped with history at every turn. The boat is at Club Nautico Marina which is great as we can run the A/C unit and escape the Low 90's heat with high nineties humidity. One Good and one Bad development this week. The bad is Kathy's needs to attend to a family emergency and flew home today. The good is that we have a signed purchase and sale agreement on our other boat Pacifica and a solid back up offer as well. Thus, I'll be flying to Florida to meet the buyer next week and show them the boat. One can only make wild guesses about new plans that will surely hatch as a result. I could probably have a complete blog that just concerned changed plans. It keeps things interesting so no complaints. 116 nautical miles to go to Cartagena so we should be in tomorrow afternoon. We are several hundred miles South and East of Hurricane Ida which is off the coast of Nicaragua. The nice thing about Panama and Columbia is that you are safely outside the area frequented by hurricanes. As a result of 'Ida' our local weather is extra calm and thus our trip to Colombia is turning into a motor sail instead of a sail. Mostly light winds, but plenty of high intensity squalls are viable with their highly convective cloud tops reaching far into the atmosphere. As I write it's really dark out here (8:50PM local). The stars are a stellar sight when you can see them and several planets are plainly visible between the clouds. Lightning in the squalls is lighting things up and has me adjusting course to try to avoid the worst of the electrical storms. No guessing which way the cells are moving though.. Yesterday we had one follow us while we traveled into the wind for many hours. Why it moved against the wind is a mystery to me. Anyway I've been adjusting course to avoid a squall ahead for the last hour and now the wind is filling in rapidly. Just shut down the engines and now sailing along at 8.4 knots. We'll soon see if my course adjustment will pay dividends or if I have us accelerating into a squall. This would be a good time to use radar to get a better feel for the movement of the surrounding squalls. The bad news is we just sold our 12 year old Furuno unit. The good news is we just sold our 12 year old Furuno unit! It worked pretty good, but was on our short list of gear to replace in the next few months. When we found a buyer to take the old radar off our hands for $350 we didn't think twice. The cost of a new base unit Furuno radar is about $1300 so we scored by selling ours for 25% of the cost of a new unit when in our mind it was 100% depreciated. I hate being in close proximity to the frequent electrical storms we seem to have here in Panama. We have met way too many cruisers whom have lost from a little to a lot of onboard electronics to lightning in the last few months. Thinking back to the South Pacific crossing from 2006-2008 we had almost no electrical activity at all. In contrast I could see an equal amount here in Panama in a weeks time or less. Caught a few Little Tunny tunas today. One turned in to Sushi for lunch and the other was baked and served with asparagus and quinoa for dinner. Yumm! It took a while to write this email (5 nautical miles) as I have to pay attention to where we sailing. The good news is it looks like we DID dodge the nasty squall that was spewing lightning bolts! Still sailing at 8.3 knots in hardly any wind. I love having a super fast easily driven boat! Couldn't get the email out last night due to poor radio signal propagation. 22nm to go to Cartagena. Sailed on an off through the night with fluky winds kicked up by squalls. After my 3AM to 6AM watch I woke to a nice breakfast and coffee. Within minutes of clearing the plates we had a fish on. Line was stripping off the reel at a rapid rate. I tightened the drag and got the boat slowed down. Still tons of line was screaming off the reel. A full fledged battle ensued for one and a half hours before we got a close look at the HUGE Yellow Fin Tuna on our line. 5'+ long with an amazing girth it was a sight to behold. One heck of a powerful fish that has my arms so played out I can barely type even after a hour break. At about one hour forty minutes we had the fish very close to the boat and he was doing a 40' diameter circles and on each pass I would get a crank or two on the reel and he would pull out a crank or two of line. We were both getting very played out and it was very uncertain whom would have the stamina to succeed before the line gave out. Finally we got him on the surface. Kathy had the rod which was bent double and I had my spear in one hand and the gaff and a cheap bottle of rum at the ready. The rum when poured into the fishes gills immediately placates him for a while. Tuna are total light weights when if comes to drinking. Anyway, I was about to let the spear fly when the wire leader broke a few seconds too soon. In defeated agony I stood on the back steps of the boat spear still in hand wondering if I could dive in and still get a shot at this monstrous fish. My better judgment kept me aboard. This was a beautiful fish and certainly would have represented the biggest tuna I would wish to try to catch as he nearly had me beat. All the better that this spectacular and beautiful creature can live on to reproduce and slow the rapid demise of our precious oceans. What would we do with a 100+ pounds of fresh tuna anyway.? Better to catch smaller fish as we try to do by using small lures and small hooks. Kathy took a few videos and still pictures of the last few moments of the battle and we'll post them eventually. We've arrived in the San Blas Islands! We checked in to Panama at the tiny island of Porvenir in what could be one of the easiest check in processes ever. They did question us a bit about where we'd been the last 24 days since checking out of San Andres, Columbia. But, even this was not a problem since we had the foresight to add a stop at the Albuquerque Cays to our Colombian 'Zarpe'. Even before we had the anchor down we had a contingent of Kuna women paddling out to the boat to show us the "Molas" that they have for sale. Google Kuna Indians of San Blas to learn more. Fascinating that a culture could stay so intact as the outside world races by. A huge rain storm last night kept me up for a few hours monitoring our position as the weather forecaster said we could get to 50 knots of wind in the squalls. Lucky for us we only saw low 20 knots with a period of intense rain. Little grouper and lobster for lunch. Kathy going for a ride behind the dinghy. Cleaning fish with the Colombian Marines and their loaded machine guns. Didn't make it to Porvenir in the San Blas Archipelago as we hoped. After anchoring near the Panama canal our Port side diesel engine started acting up. With the engine refusing to idle we took pause as well. We moved the boat to a secure anchorage near Isla Linton for further investigation. By the time we arrived at the new anchorage the engine refused to run at all. Two engines certainly is convenient at times like these. Good thing Panama is an excellent place to find parts and expertise to repair engines. We've contacted a yacht agent to help us with the check in procedures as we are now not too near a port of entry and thus the yacht agent can help smooth out this little detail. Getting down to business I began working to diagnose the engines ailment. Having lived in a temperate climate most of my life it was hard to fathom just how much one can sweat in the confines of an engine room in the tropical heat and humidity of Panama. Think you sweat a lot in a sauna? Not even close! Alarming amounts of sweat! Salty sweat is pooling up in my Crocs and soaking my shorts. Quantities sufficient to make the engine even more rusty next time I look in on it. Today, I spent the day in the engine room. Got an injector replaced with a spare to see if that would make any difference. The injector was totally rusted and well seized to the head. I tapped, twisted and 'gasp' even used a hammer... still not a budge. I was about to pull the whole head off and take it to a mechanic to have him replace the injectors when I had an idea. An idea that actually worked none the less. I had Kathy crank the engine while I tapped and twisted on the injector. At first just a little bit of exhaust gases leaked by then slowly the compression worked the injector out. Eventually, it shot out of the head with a substantial and startling report! These diesel engines have some serious compression! After lots of rust removal on the head I fitted the new injector and the engine will now idle correctly. Now we can defer serious repairs a few more months so we can explore the San Blas if all continues to go well. Our plans are of course in complete flux... just like we like them. An excellent anchorage at position: 09°25.6297 N 079°48.1682 W about 6nm SE of the entrance to the Panama Canal. This was not our intended destination, but it was getting late in the day and we are having a little difficulty with one of our engines. As we approached the Panama coast we were greeted with lots of squall activity, strong winds and heavy rain. Not exactly ideal conditions for negotiating the heavy shipping traffic moving in and out of the Panama Canal. Again, the AIS was invaluable in identifying ship movement and possible hazards. The skys cleared as we approached the anchorage and we enjoyed wonderful and surprisingly cool evening. I think the temperature dropped to a chilly 79 degrees likely due to the heavy rains. Today we will begin a slow journey toward Cartagena, Colombia. We expect may take around two weeks as we leisurely cover the 330nm with short day sails. Time 0000 UTC or 6PM local. About 125 nautical miles off Costa Rica heading just West of Colon, Panama 141°T @ 155nm. Wind direction is not living up to our hopes so we are fighting for all the 'Easting' we can get. At the moment the best course we are willing to sail is 145°T. Porvenir, Panama the administrative center of the San Blas archipelago lies at 125°T @ 190nm and Cartagena, Columbia lies at an impossible 99°T @ 360nm. Winds are out of the East at about 15 knots. We are now about 55 nautical miles into our voyage and although we've tweeted the course up from an initial heading of 160°T to 145°T there is no way we can lay a course to Cartagena at this point so that's off the table. Now we are just hoping to lay something East of Colon, Panama, hopefully Porvenir. The sun just set and it looks like we are in for a nice sail overnight with settled weather. Before it get's real dark we'll take in a reef on the mainsail. Most of the day we've been sailing between 8 and 9.5 knots so the small penalty for reducing sail is no big deal vs the benefit of having reduced main sail if we get hit by a squall in the night. As we approach the Panama, Canal shipping traffic should increase and in addition to keeping a sharp lookout 24 hours a day we'll enjoy the extra info provided by our AIS. Our Class B AIS continuously sends information about our position, course and speed to other ships and receives the same info from them. You can now see ships on your AIS receiver before you can see them visually. Unfortunately, not all ships are fitted with transceivers. But, the really big ones are so that's something. We had only one bite on the fishing line today and since it's getting dark have reeled in the line until first light tomorrow. Just hit 10.2 knots so it's time to get off the computer and reduce sail. I love the pilot house it's so cool to see everything that is going on and still be able to type an email. A reef is in and we are now at a more reasonable speed of 8.80-9.20 knots with the wind forecast to moderate overnight we can shake a reef out in the morning. During the day the schedule is relaxed and we just take nap breaks as we need them. Colombian Marines 'Operation-- Cell phone signal'. This morning we delivered a fresh batch of cookies and a few music CD's to the twelve Colombian troops stationed at Albuquerque Cay. The commander asked if we could return at 2PM and take a few of the guys out in the dinghy in hopes of getting a cellar signal so they could call their families. I suggested they climb the 20 meter tall light tower as this would be the best way to improve the line of sight transmission of cell phones. No takers on climbing the tower and the commander, as if acting out a game of charades, made the motions of a person falling off the tower and hitting the ground with a thud. Hmm. With a combination of my 'Spanglish' and my own turn at charades I suggest that these strong young guys could easily climb the tower and talk on their phones at the same time. Certainly, it must be safer than say texting while riding a motor cycle... yes, I've actually seen this done in the neighboring island of San Anders. San Andres is 50km away, a hopeless distance for a cell phone. Regardless, high command decided that we must go. I then drew a picture of the island in the sand with my toe and asked just how far they wanted to go in the dinghy. After a protracted discussion and more sand drawings it was decided that we need only go 1.5 kilometers from the island. Maybe I was missing something as these guys really seemed to think that 1.5 km would help. I remained highly skeptical and suggested someone climb the tower to test my theory. I think my suggestion was lost in translation as still no takers on climbing the light tower. The commander suggested I bring my GPS. So we wouldn't get lost? Or perhaps to know when we were 1.5 km from the island? I'll never know. We synchronized our watches to 'mission time' by gauging the height of the sun through the overhead palm trees. Kathy and I spent the interim hours going for a snorkel. We captured a nice lobster and huge conch. After lunch I headed for the beach to find no less than six marines with cell phones in hand. Luckily, I have a large zip lock bag for my GPS so we add the cell phones for safe keeping. The guys pile in with snorkel gear so I infer we are going for a swim as well? We stop by LightSpeed and pick up the spear and a extra mask and fins and offshore fishing pole. Now picture seven guys packed in a dinghy with snorkel gear, a bag of cell phones and a giant fishing pole. Off we go. The commander is driving the boat... clearly his first time at the helm. We zig, we zag the troops point north the commander heads east and so on we zig we zag. Lots of water splashes in the boat. I'm pretty sure this is a hopeless mission, but want to give it my best shot so we head out 3.5 km over twice the agreed distance. Cell phones come out of the bag and.... no luck. No surprise it's still 45 km to the nearest cell tower. I try to explain the curvature of the earth and line of sight communications using my 'Spanglish' and a spool of fishing line. I'm pretty sure that they were just nodding along so I'd shut up and everyone could go for a swim. I gave orders in newly minted Spanish to drop the anchor. It really worked as I watched the camp cook throw the anchor over the side. However, I didn't issue the order to tie the anchor to the anchor rope FIRST. So, off goes the anchor to the semi deep sans an anchor line. In the interim the offshore fishing reel and line are still in play and now hopelessly snagged on coral. I send a guy over the side to untangle the mess and he says the line is wrapped around some coral. We are quickly drifting in the current so I tell him to just cut the line and save the lure. Lost in translation he jumps in the water swims about five feet from the boat and cuts the line. Needless to say the lure is hopelessly lost and... the anchor is pretty much lost as well at this point. I dead reckon back to where I reckon the anchor might be and send in swimmers to start a search for the anchor. One, the jovial camp cook, goes in without fins and apparently without much if any swimming lessons. I pull away from the search site a bit to keep everyone safe from the outboard propeller and the commander starts a new game of charades and acts out a drowning person. Apparently, it's the Cook. He does look a bit panicked. The cook is not exactly slim and I don't think he could sink with his built in flotation if he tried. The commander is very concerned about the situation and everyone is relived once we hoist the wide eyed cook aboard. The remaining two swimmers also scamper aboard. Now imagine for a moment the scene of tangled bodies as three guys spill into a dinghy all at once. It took a few minutes to get everyone upright and settled. Ok, all is good but, still no anchor and now have at least three inches of water in the dinghy. Really a not issue as an inflatable boat can't really sink. The best two swimmers go back in the water they finally retrieve the anchor. I tie the knot and we send the anchor back to the deep. The cook at this point is really getting a good teasing by everyone for his antics. A few guys want to go for a swim to try to spear some fish. All the climbing in and out of the dinghy paired with being a little overloaded we now have four inches of water in the dinghy. The freshly speared fish are still pretty much alive when they get plucked off the spear and dropped in the dinghy. Fish are literally swimming around inside the boat as they bleed to death. The water is a getting pretty bloody and the fish are splashing the blood and gut filled water all over us. Apparently, everyone else thinks this is normal as no attempt is made to either bail out the dinghy or kill the fish... both would be prudent ideas. I'd really like to go for a swim for myself, but am loath to leave even the anchored dinghy under anyone else's command for fear of what might happen next. I just chill and go with the flow. Fish swimming around my feet in a blood bath and all. I join in the fun and tease the cook. On the way back to the island we zig and we zag and make another four stops for more spear fishing and also tangle the fishing line on a reef again. I let the guys think it's a fish for a while as they are really getting into the fight. The dinghy is drifting and line is going off the reel. Nearly, everyone has a hand on the pole and is helping to battle the 'grande pescado' there is lots of excitement. After a while I burst the bubble. Now it's time to see if we can rescue the fishing lure. Starting a new game of charades I mime a fish hook in my mouth and then point at my self. 'Bring me the hook this time' I say... in English of which 100% is surely lost in translation. The hook rescue swimmer nods 'Si, Si' and in he goes. He then pops back up and I think he says the water is too deep. I say 'no' which translates perfectly. Then vigorously encourage him with sign language to get the hook. The water isn't that deep. To my surprise up comes the rescue swimmer hook and all. Back in the dinghy I proudly give him a good solid pat on the back and say something like 'bueno, bueno, gracias mi amigo' which evokes a good laugh from everyone. Back at the beach the guys give the dinghy a good scrub and we shake hands all around. The guys testing out some new English words and me practising my Spanish. As a parting bonus, I receive an authentic Colombian Marines hat. IF I do another 'Operation-- Cell phone signal'or something similar I think I'll bring a few life jackets and leave my fishing pole at home. After taking a group of Marines spear fishing the other day we were invited in for lunch the next day. Upon landing on the perfect white sand beach, a full tour of the island ensued. The island is about 900' x 600' with a few small buildings at the center. Radiating outward like wagon wheel spokes from the center buildings are perfectly groomed paths about 4' wide each lined with conch shells. Conch shells also form breakwaters 4-5' high on the back side of the island. Think many tens of thousands of conch shells. Simply amazing! At the terminus of each path is a military bunker, really just a few sand bags. Nicaragua disputes ownership of these islands so Columbia has installed the marines to maintain her claim. A group of marines showed us every nook and cranny of the islands from fox holes, bunk room, kitchen, soccer field, cemetery, etc. We took our time and stopped many times along the way, but still only took maybe 30 minutes to circumnavigate the island and see everything. This island must feel really small to these twelve 18-21 year old soldiers who are station here for 30 days at a time. Of course their island is a 858' longer and 577' wider than ours! So they must think we get really bored. It was full immersion Spanish while on the island, but we all enjoyed the visit and we had lots of laughs. One guy acted as the translator. Now he didn't speak a word of English but he spoke Spanish VERY slow and clear. After we would say something in our 'Spanglish' he would translate into real Spanish for the group. Lunch was prepared by the cook in the most primitive of kitchens with just a two burner camp stove in the corner. Despite the lack of facilities the chicken and rice with a side of fried plantains was excellent. After lunch we took the guys out for another spear fishing session and they definitely caught enough fish for dinner. Look for grey colored reef sharks and lobster here. Look for grouper hiding on the off lying small heads on East side in the deepest water. Look for grey reef sharks, nurse sharks and grouper. Yesterday a tropical wave passed through and blasted us with torrential rain most of the day. A tropical wave is disorganized makings of a tropical storm or hurricane. Basicly, lots of squalls and moisture and lots of lightning with rain pouring out of the sky at a spectacular rate. About mid day we had a brief respite and I dumped out a bucket that was sitting in the cockpit. A few hours later is was overflowing... that's some torrential rain. Lighting was blasting off with zero delay between flash and bang with a little sizzle thrown in to really make you think you might be next. I spent the rainy day mostly working on installing a new navigation program on the computer, that is between times that I thought we might get a strike and had put the computer in to the safe where it might be protected from the destructive inductive flow of energy. A few weeks ago another catamaran was struck by lightning at this very location so I was comforted by the old adage that 'lightning doesn't strike twice'(in the same location...we hope). Today most of the squalls have passed so we planned a early snorkel trip. We went out to the reef about 1/2 mile in front of the boat and managed to find a miniature pass between coral heads so with my adventurous spirit we blasted out through the breakers. Outside the reef we enjoyed really awesome underwater visibility, but were unable to locate any lobsters, our stated mission for the day. It would have been REALLY risky to enter back over the reef without expecting to ding the outboard engine propeller so we took the safe route and went about 1.5 miles to the south to the end of the reef. Much to our surprise we passed four small fishing boats outside the reef in this short distance. Back inside the reef we combed every patch of coral and I shot a few fish. Then we hit the jack pot of very rare 'Slipper Lobster'. A slipper lobster is more prehistoric looking than a typically Caribbean lobster and has no 'feeler antennae' only two small plates that extend forward. The beasts are hard to spot tucked up in holes in the reef, but very easy to catch once you find them. Nothing spiny to poke you so you can grab them with a bare hand if necessary. A real bonanza of five were found and also five conch and a huge crab. We let the crab go after a quick picture. Later I took five Colombian navy guys for a fishing expedition in the dinghy. It was great fun even though they spoke zero English. We saw lots of nurse sharks and rays and this gave the guys a real thrill. Several scrambled back into the dinghy in a bit of panic. A couple of the brave ones wanted to spear a 3' wide sting ray, but I said it was probably not a good idea. We caught a dozen fish, a lobster, several conch and as a bit of a show off I grabbed the tail of a sleeping nurse shark. Good times all around. Tomorrow we are invited to dine with the military ashore. Should be fun. Of all the countries we have traveled to in the past few years the Colombians are by far the nicest we have met. They will go out of their way to give you directions or show you the way or just to chat. They are a very sociable lot. On the island of San Andreas there are a handful of liquor stores that turn out to be the social gathering place for the evening. Just walk in, buy your poison and hang out outside with the music blaring. If your lucky there might be a few chairs and even some tables. One such night we met a young couple there on holiday from Bogota. One a banker, one an accountant. Products of the young growing economic boom of Bogota. The were happy to practice their English and I, Kathy, got an impromptu salsa and meringue lesson. The guy was so cute when he would tell me to move my lips. I corrected him a few times by shouting out over the music "hips", but he never caught on. Well it was more entertaining that way. We became fast friends and they are excited to show us around their city if we make it up there. What was extra nice about San Andreas is that even though it's a tourist island we never got harassed by vendors selling snorkel trips, coconuts or any thing else. Frankly they see us gringo's and they don't know what to do with us. We think we saw 2 other North Americans why we where there but no sure. In general it's really just a holiday place for Colombians. This morning were boarded by Columbian Coast Guard for an brief inspection of our paperwork. They run a open deep-v boat with triple two hundred HP engines that they say goes 48-52 knots. Must be a pretty rough ride going that fast in the swells. Anyway, very nice guys the commander even took off his combat boots while he was aboard. The crew of the patrol boat stood by in full gear including, long pants, combat boot, long sleave shirts, life jackets and ski masks. Not sure why the ski masks, maybe due to the harsh sun all day? I know I got a nice burn yesterday so it could make sense or maybe for wind burn going so fast. 1) A sailboat at Albuquerque Cays was stuck by lightning on Sun/Mon? during a severe squall as the last Tropical waved passed by. Not sure if we know the boaters, but hope everyone is OK.
2) The Coast Guard said they found 4 million USD here at Albuquerque Cays burred on the island using drug and money sniffing dogs. Two days ago! A day late and 4 million short. Hmm. Maybe we should get a dog and taking it for lots of potty breaks. Anybody know how to train a dog to sniff for Ben Franklins? 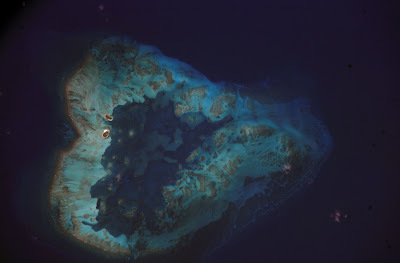 Just dropped the hook at Cayo Albuqurque, Columbia about thirty nautical miles south of San Andreas. About one minute after the anchor was down Kathy was in the water hunting for dinner. I quickly followed and after a long swim Kathy spotted a nice big lobster. After harvesting the lobster and handing it off to Kathy my spear gun found another target and we enjoyed an early dinner of lobster and fish at an unmatched level of freshness. Planning on lots of snorkeling tomorrow and lots of lobsters. One of our next stops is at Albuquerque Cays or Cayo Albuquerque about 20 nautical miles South of San Andreas. We hear that the cays are spectacular. This image is from the international space station. It appears to be oriented 180 degrees out thus, in need of 180 degree rotation. Here's the route we hope to use. Until we get a chance to edit DO NOT USE THESE WP's. 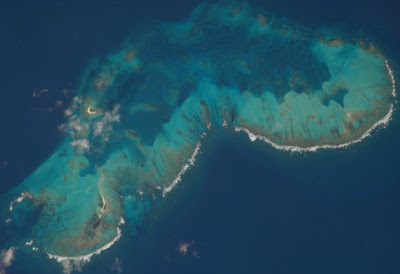 Another ISS short shows off the pristine Cayo Este Sudeste or ESE Cays about 17 nm to the ESE of San Andreas. This image needs to be rotated 90 degrees counter clockwise. We hear that visibility is 200' while snorkeling. A road rings the island. Our trip was cut short by a huge rain storm so we only went about half way around the island. Notice huge conch shells that crown this wall. San Andres roads. Note wrecked boat on shore. There are lots of ship wrecks here including a 300' local supply ship that hit the reef back in January. A local ship and local captain and he still lost the ship to a moment of bad judgment. Two adults two kids one moped. Not an unusual sight. Kathy and a scooter we borrowed for the day. The most popular mode of transportation on the island of San Andres is motor bikes, busses, walking and cars in that order.